Reading and share top 32 famous quotes and sayings about Time Paradox by famous authors and people. Browse top 32 famous quotes and sayings about Time Paradox by most favorite authors. 1. "It was the time of year when the atmosphere streamed with unexpected hints and memories, and a paradoxical sense of renewal." 2. "The democratic nations that have introduced freedom into their political constitution at the very time when they were augmenting the despotism of their administrative constitution have been led into strange paradoxes. To manage those minor affairs in which good sense is all that is wanted, the people are held to be unequal to the task; but when the government of the country is at stake, the people are invested with immense powers; they are alternately made the play things of their ruler, and his masters, more than kings and less than men. After having exhausted all the different modes of election without finding one to suit their purpose, they are still amazed and still bent on seeking further; as if the evil they notice did not originate in the constitution of the country far more than in that of the electoral body." 3. "When John left the band, I resented him for not being my friend and for abandoning our musical comradeship. But all the time that he was out of the band and going through his anguish, I prayed for him constantly. From going to meetings I'd learned that one of the reasons that alcoholics get loaded is because they harbor resentments. One of the techniques they teach to get rid of a resentment toward somebody is to pray for him or her to get everything that you want for yourself in life-to be loved, to be successful, to be healthy, to be rich, to be wonderful, to be happy, to be alive with the light and the love of the universe. It's a paradox, but it works. You sit there and pray for the person you can't stand to get everything on earth that you would want for yourself, and one day you're like 'I don't feel anything bad toward this person." 4. "In its quest to discover how the patterns of reality are organised, the story of modern science hints at a picture of a set of Chinese puzzle boxes, each one more intricately structured and wondrous than the last. Every time the final box appears to have been reached, a key has been found which has opened up another, revealing a new universe even more breathtakingly improbable in its conception. We are now forced to suspect that, for human reason, there is no last box, that in some deeply mysterious, virtually unfathomable, self-reflective way, every time we open a still smaller box, we are actually being brought closer to the box with which we started, the box which contains our own conscious experience of the world. This is why no theory of knowledge, no epistemology, can ever escape being consumed by its own self-generated paradoxes. And this is why we must consider the universe to be irredeemably mystical." 5. "Many of my all-time favorite movies are almost entirely verbal. The entire plot of My Dinner with Andre is "Wallace Shawn and Andre Gregory eat dinner." The entire plot of Before Sunrise is "Ethan Hawke and Julie Delpy walk around Vienna." But the dialogue takes us everywhere, and as Roger Ebert notes, of My Dinner with Andre, these films may be paradoxically among the most visually stimulating in the history of the cinema:"
6. "The first commendment of hte post 1970s meritocracy can be sumed up as follows: "Thou shall provide equality of opportunity to all, regardless of race, gender, or sexual oritentation, but worry not about equality of outcomes." But what we've seen time and time again is that the two aren't so neatly separated. If you don't concern yourself at all with equality fo outcomes, you will, over time, produce a system with horrendous inequality of opportunity. This is the paradox of meritocracy: It can only truly come to flower in a society that starts out with a relatively high degree of equality. So if you want meritocracy, work for equality. Because it is only in a society which values equality of actual outcomes, one that promotes the commonweal and social solidarity, that equal opportunity and earned mobility can flourish." 7. "To say that one waits a lifetime for his soulmate to come around is a paradox. People eventually get sick of waiting, take a chance on someone, and by the art of commitment become soulmates, which takes a lifetime to perfect." 8. "Your sense of paralysis will be intensified if your family and friends are in the habit of pushing and cajoling you. Their nagging should statements reinforce the insulting thoughts already echoing through your head. Why is their pushy approach doomed to failure? It's a basic law of physics that for every action there's an equal and opposite reaction. Any time you feel shoved, whether by someone's hand actually on your chest or by someone trying to boss you around, you will naturally tighten up and resist so as to maintain your equilibrium and balance. You will attempt to exert your self-control and preserve your dignity by refusing to do the thing that you are being pushed to do. The paradox is that you often end up hurting yourself." 9. "The fraudulence paradox was that the more time and effort you put into trying to appear impressive or attractive to other people, the less impressive or attractive you felt inside — you were a fraud. And the more of a fraud you felt like, the harder you tried to convey an impressive or likable image of yourself so that other people wouldn't find out what a hollow, fraudulent person you really were. Logically, you would think that the moment a supposedly intelligent nineteen-year-old became aware of this paradox, he'd stop being a fraud and just settle for being himself (whatever that was) because he'd figured out that being a fraud was a vicious infinite regress that ultimately resulted in being frightened, lonely, alienated, etc. But here was the other, higher-order paradox, which didn't even have a form or name — I didn't, I couldn't." 10. "I've built something valuable here. But valuable things also have a way of being misunderstood in their own time. Everyone wants a quick fix. We're tired of being afraid, tired of being sad, tired of feeling overwhelmed, tired of feeling tired. We want the old day back, and we don't even remember them, and we want to push into the future, paradoxically, at top speed. Patience and forbearance become the first casualties of progress." 11. "Only by acknowledging the full extent of slavery's full grip on U.S. Society - its intimate connections to present day wealth and power, the depth of its injury to black Americans, the shocking nearness in time of its true end - can we reconcile the paradoxes of current American life." 12. "If the Universe came to an end every time there was some uncertainty about what had happened in it, it would never have got beyond the first picosecond. And many of course don't. It's like a human body, you see. A few cuts and bruises here and there don't hurt it. Not even major surgery if it's done properly. Paradoxes are just the scar tissue. Time and space heal themselves up around them and people simply remember a version of events which makes as much sense as they require it to make." 13. "But that can't work, can it?" Said Richard. "If we do that, then this won't have happened. Don't we generate all sorts of paradoxes? "Reg stirred himself from thought. "No worse than many that exist already," he said. "If the universe came to an end every time there was some uncertainty about what had happened in it, it would never have got beyond the first picosecond. And many of course don't. It's like a human body, you see. A few cuts and bruises here and there don't hurt it. Not even major surgery if its done properly. Paradoxes are just the scar tissue. Time and space heal themselves up around them and people simply remember a version of events which makes as much sense as they require it to make. That isn't to say if you get involved in a paradox a few things won't strike you as being very odd, but if you've got through life without that already happening to you, then I don't know which universe you've been living in, but it isn't this one"
14. "Ah, yes, the trusty time paradox. If I go back in time and kill my grandfather, then shall I cease to exist? I believe, as Gorben and Berndt did, that any repercussions are already being felt. We can only change the future, not the past or present. If I go back, then I have already been back.- Artemis Fowl"
15. "She abandoned me. This was devastating. And the paradox was that the moment she abandoned me, she began to be with me at all times, constantly abandoning me wherever I would go, whatever I would do and with whomever I was. And the pain was unbearable. Hence, I decided to abandon everyone and everything, remaining with nothing, doing nothing and being absolutely alone. Well, the paradox is that she is still there!" 16. "It was time to expect more of myself. Yet as I thought about happiness, I kept running up against paradoxes. I wanted to change myself but accept myself. I wanted to take myself less seriously -- and also more seriously. I wanted to use my time well, but I also wanted to wander, to play, to read at whim. I wanted to think about myself so I could forget myself. I was always on the edge of agitation; I wanted to let go of envy and anxiety about the future, yet keep my energy and ambition." 17. "Before I do a play I say that I hope it's going to be for as short a time as possible but, once you do it, it is a paradoxical pleasure. One evening out of two there are five minutes of a miracle and for those five minutes you want to do it again and again. It's like a drug." 18. "Time, though infinite, is paradoxically also short, and, to be blunt, getting shorter." 19. "The next day, when I was sober, I thought again about the three of us, and about time's many paradoxes. For instance: that when we are young and sensitive, we are also at our most hurtful; whereas when the blood begins to slow, when we feel less sharply, when we are more armoured and have learnt how to bear hurt, we tread more carefully." 20. "Because we demand a future, we live each moment in expectation and unfulfillment. We live each moment in passing. In just this way the real nunc stans, the timeless present, is reduced to the nunc fluens, the fleeting present, the passing present of a mere one or two seconds. We expect each moment to pass on to a future moment, for in this fashion we pretend to avoid death by always rushing toward an imagined future. We want to meet ourselves in the future. We don't want just now—we want another now, and another, and another, tomorrow and tomorrow and tomorrow. And thus, paradoxically, our impoverished present is fleeting precisely because we demand that it end! We want it to end so that it can thereby pass on to yet another moment, a future moment, which will in turn live only to pass." 21. " What's silly is paying five bucks for hot milk and flavored syrup! But now I see what's really been going on all this time! They charge you all that money because they need it for the R & D! 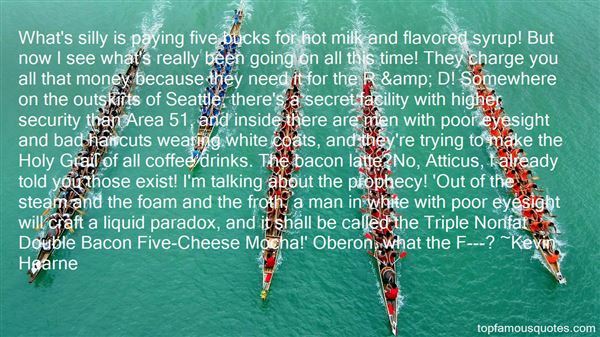 Somewhere on the outskirts of Seattle, there's a secret facility with higher security than Area 51, and inside there are men with poor eyesight and bad haircuts wearing white coats, and they're trying to make the Holy Grail of all coffee drinks. The bacon latte?No, Atticus, I already told you those exist! I'm talking about the prophecy! 'Out of the steam and the foam and the froth, a man in white with poor eyesight will craft a liquid paradox, and it shall be called the Triple Nonfat Double Bacon Five-Cheese Mocha!' Oberon, what the F---?" 22. "Bits have unique properties, then, that we can use to our advantage: they're super-small, super-fast, easily acquired and created and copied and shared in near-infinite quantity, protected from the ravages of time, and free from the limitations of distance and space. In practice, though, bits reveal several paradoxes: they're weightless, but they weigh us down; they don't take up any space, but they always seem to pile up; they're created in an instant, but they can last forever; they move quickly, but they can waste our time." 23. "The people we love are usually stronger than we give them credit for. It is the nature of love, perhaps, to want to shoulder all the pain rather than see the loved one suffer. But sometimes pain is better than emptiness. I have been so empty Kit. All my life. 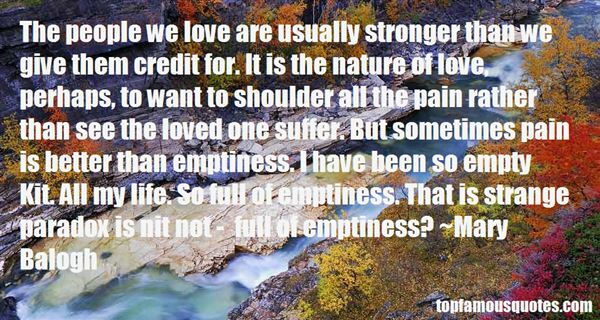 So full of emptiness. That is strange paradox is nit not - full of emptiness?" 24. "Neither agreeable nor disagreeable," I answered. "It just is. "Istigkeit — wasn't that the word Meister Eckhart liked to use? "Is-ness." The Being of Platonic philosophy — except that Plato seems to have made the enormous, the grotesque mistake of separating Being from becoming and identifying it with the mathematical abstraction of the Idea. He could never, poor fellow, have seen a bunch of flowers shining with their own inner light and all but quivering under the pressure of the significance with which they were charged; could never have perceived that what rose and iris and carnation so intensely signified was nothing more, and nothing less, than what they were — a transience that was yet eternal life, a perpetual perishing that was at the same time pure Being, a bundle of minute, unique particulars in which, by some unspeakable and yet self-evident paradox, was to be seen the divine source of all existence." 25. "But, Doctor. The human race didn't die out in 1984.' ‘New timeline. It's a paradox.' ‘And you're the paradoctor?' ‘Just the Doctor." 26. "We sit silently and watch the world around us. This has taken a lifetime to learn. It seems only the old are able to sit next to one another and not say anything and still feel content. The young, brash and impatient, must always break the silence. It is a waste, for silence is pure. Silence is holy. It draws people together because only those who are comfortable with each other can sit without speaking. This is the great paradox." 27. "Time, we like to say, cures all. But maybe the old saying doesn't mean time heals. Time cures a secret in its brine, keeping it and finally, paradoxically, destroying it. Nothing is left in that salt solution but the pain or rage, the biting shame that lodged it there. Even they are diluted or denied." 28. "THE evidence for evolution grows by the day, and has never been stronger. At the same time, paradoxically, ill-informed opposition is also stronger than I can remember. This book is my personal summary of the evidence that the ‘theory' of evolution is actually a fact – as incontrovertible a fact as any in science." 29. "Aristotle said time is a measure of change, and this movie is about changing in time, through time, while remaining the same person. That's a philosophical paradox and a moral dilemma. But 'Casablanca' says it's possible. You can have both. That's what it means. And that's my wish for you: that you would have both." 30. "I'd say that most of these [poems in Jason Mashak's book SALTY AS A LIP] are just straightforward enough, but not entirely explainable or attributable to a single cause/effect, which makes them the kind of poems I want to read many times… "Salty as a lip" is my favorite. It's so alive: strange and human / earthy and raw. Mysterious but grounded. Mashak has manifested paradox, it seems. Bravo!" 31. "The train swung around the curve, the engine puffing with short, heavy blasts, and they passed smoothly from sight that way, with that quality about them of shabby and timeless patience, of static serenity: that blending of childlike and ready incompetence and paradoxical reliability that tends and protects them it loves out of all reason and robs them steadily and evades responsibility and obligations by means too barefaced to be called subterfuge even and is taken in theft or evasion with only that frank and spontaneous admiration for the victor which a gentleman feels for anyone who beats him in a fair contest, and withal a fond and unflagging tolerance for whitefolk's vagaries like that of a grandparent for unpredictable and troublesome children, which I had forgotten." 32. "One such time I left town and on my way back, at a point where the land was high and I could see the sea to my left and down the road a long ways, I suddenly felt I was in heaven. The spot was in fact no different from when I had passed it not long before, but my way of seeing it had changed. The feeling, a paradoxical mix of pulsing energy and profound peace, was intense and blissful. Whereas before the road, the sea, the trees, the air, the sun all spoke differently to me, now they spoke one language of unity. 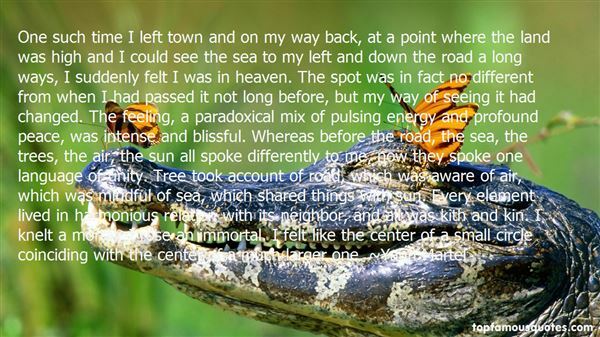 Tree took account of road, which was aware of air, which was mindful of sea, which shared things with sun. Every element lived in harmonious relation with its neighbor, and all was kith and kin. I knelt a mortal; I rose an immortal. I felt like the center of a small circle coinciding with the center of a much larger one." Then she smiled and told me I was cute, and that I should be careful, and I asked her why, then she said that she might fall for me, but I know she was joking, because who would want to fall for me? I'm a mess."